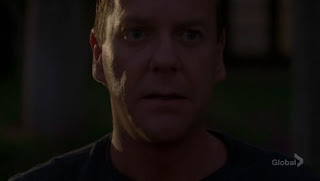 This season, 24 has drawn much criticism for the scattered nature of the episodes, how it started strong but supposedly fizzled, ended a major plot line early, etc. However, if you consider the place that this season plays in the larger context of the series as a whole, you can see that Day 6 proves a pivotal piece of the larger story. For instance, some people disliked the fact that the story did not revolve around Jack Bauer like other seasons. However, this season was not like any other season. Jack was not there when the terrorist attacks started. They had been going on for 10 weeks when he arrived on the scene. Jack has was just thrown into this situation. The scattered nature of some of the plot elements reflects the scattered nature of the threat. Also, this entire season has been about Jack coming to grips with what his life has become. Through his sacrifices for his job and his country, Jack has literally lost everything. He desperately sought to hold on to Audrey because she represented the only thing that he had left that bore the semblance of a normal life. From the time that Jack stepped off the plane, every episode has shown in some form or fashion the effects that 20 months in China (and his career at CTU) has had on him. Though he has got the job done, he has been falling apart this whole season. The scene at the end with Jack and Sec. of State Heller's conversation was a fitting conclusion to the character development (regression) that this season displayed. Jack gave up everything for his country, and his country abandoned him due to political expediency. As he said, "I want my life back." But Heller's comment to him was telling: "You can't stay out of the game." As Jack said to Audrey in the next scene, he is at a crossroad. There was an electric melancholy / nostalgic electricity when Bauer stumbled out of the house and onto the pier overlooking the Ocean. He had come to the end of something, and he knew he could never go back to the way that it was. This was the only way you could have ended this season. The silent clock was a perfect and fitting way to end the "day." It was the end of an era, an intense catharsis. If 24 goes on to deliver a few more quality seasons, then this season will have played a crucial role in the development of the series as a whole. You could not get past where the show was at without Day 6. No other ending could have had the effect that this one did. I am excited about next season, precisely because I have no idea where Bauer's escapades will take him. Further, season 6 brings seasons 4-6 to a resolution, much the same way that season 3 brought seasons 1-3 to a close. Both of these units are self contained and largely contingent upon one another. Both season 3 and season 6 ended with Jack feeling the full brunt of the past three "days." In its reiteration of season 3's thematic ending, 6's final moments concluded the whole series up until this point. If you interpret the past 6 seasons like this (rightly), then you can see that, if the producers play their cards right, there will be at least a few more mindlessly repetitive seasons intriguing and provocative "days" left up Jack Bauer's sleeves.